In today’s world of scientific progress and advanced technology, where there seems to be an abundance of cheap foods that are full of fat and sugar, it’s easy to forget that there are still less fortunate parts of the world that have not enjoyed the same benefits and prosperity that many have come to take for granted. For millions of people in the developing world, every day is a struggle for survival, living in constant uncertainty of where the next morsel of food will come from. The result is millions of malnourished people, many of them children. International relief efforts from the UN’s World Food Program and other similar organizations often fall short, in part defeated by the massive logistical requirements of providing so many different food items required to provide people with balanced and nutritious meals. Part of the solution to treating the malnourished people of the world would be to provide them with a single food that would be easy to cultivate and can be grown almost anywhere while providing all of the vitamins, minerals, and nutrients required to foster proper growth and development. Such a food has already been found, and has been labeled as the “best food for the future” by the United Nations since 1974: It is called Spirulina. Spirulina may be small in size, but its advocates claim it’s a nutritional powerhouse. As one of the many “hot” products in the vast and complex world of nutritional supplements, its usage has exploded exponentially in recent years and has created a hype that may or may not be supported by conclusive scientific evidence. What is spirulina, and what are its benefits? 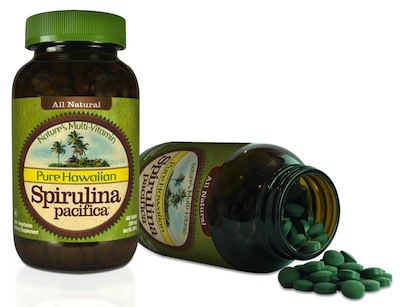 Spirulina is a blue green algae that grows naturally in lakes and other bodies of fresh water. These algae have been cultivated as a major foodstuff for hundreds of years, mainly in Central America. Spirulina is one of the most nutrient rich foods known to man. It is a complete source of protein, containing every essential amino acid that our body uses to build healthy muscle and tissue. Spirulina is also rich in essential fatty acids, the substances which protect and promote cardiovascular and brain functions. Spirulina is an excellent source of protein for people trying to eliminate meat from their diet. Phycocyanin – High concentration of this powerful, blue, immune-stimulating biliprotein. GLA – highest natural form next to mother’s milk – glandular- balancing, anti-inflammatory. Glycogen –The only vegetable source for this ready-made glucose in stored-energy form. EFA’s – The much-needed Omega 3- and 6- Essential Fatty Acids. Chlorophyll – deep-green blood-builder, directly harnesses sunlight. A Full – Spectrum of Vitamins – More than any other single food, in balanced concentrations. Ocean Source Minerals & Abundant Trace Elements – from the deep clean ocean over 90 minerals in all. The building blocks for over 2,000 enzymes with 2-3 times the energy of any other ‘live food’. Animal research has provided the strongest evidence of the health benefits associated with spirulina. Researches at the University of South Florida have found that rats that were given diets supplemented with spirulina following induced strokes showed brains lesions 75% smaller than those of control group rats. The same team has also found that the brains of aged rats that were fed spirulina supplements (which have high antioxidant activity) maintained their neuron function much better than those rats fed with cucumbers (which have less antioxidant activity). The spirulina-fed rats also showed far less free-radical damage. Free-radical damage is associated with aging and diseases like Alzheimer’s and cancer. Whether these free-radical-reducing results seen in rats are present in humans is yet to be seen. Spirulina, meaning ‘little spiral,’ is a microscopic, spiral shaped, plankton blue green algae that appeared on the planet over 3.6 billion years ago. A simple hydrocarbon vegetable, it is made directly from photosynthesis – the pure interaction of sunlight and water. Spirulina is the most concentrated form of any known organic food. Full of nutritional wonders, it has a rich history and holds unlimited potential for the future. Recognizing these qualities, Dr. Christopher Hills and renowned microbiologist Dr. Hiroshi Nakamura shifted their research to Spirulina in 1967. In their quest to find a nutritious solution to world malnutrition and starvation, they set out to pure ~ culture and grow the best Spirulina possible. Spirulina, the most nutrient ~ dense of all algae on the planet, met their criteria with “championship qualities”. They dedicated over twenty years developing technology, sharing their cultures and research, and growing Spirulina all over the world. Their work was just the beginning of an unprecedented wave of medical research and a world-hunger solution project that still goes on today. Spirulina cleanses and nourishes, balances and energizes, strengthens and protects, regenerates and rejuvenates. Taking Spirulina as a food can truly change your life. From a personal experience of Radiant Health to the bigger picture of ‘Making a Difference’, no matter your perspective, Spirulina is the optimum choice. WHY IS IT CALLED A COMPLETE FOOD? 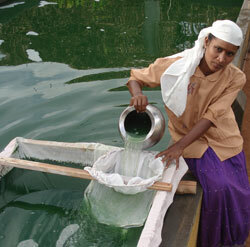 Our Spirulina is currently grown at one of the most advanced aqua farms in a sunny location in India, which. provides perfect year-round temperatures and a twelve-month growing season. Adapting to intense sunlight, one of Spirulina’s natural gifts, has resulted in a strain with the highest levels of mixed carotenoids of any Spirulina in the world. It is cultured in long, shallow raceway ponds filled with fresh water drawn from deep in the rain forest aquifer, supplemented with oceans water drawn from a depth of over 2,000 feet, and in the clean air of the most geographically-remote islands in the world. Food-grade sodium bicarbonate keeps the water very alkaline, which is Spirulina’s favorite natural environment, and the water is further enhanced by a proprietary blend of essential nutrients. Paddlewheels gently stir the cultures, ensuring optimum light for each cell and helping the pond to release oxygen. 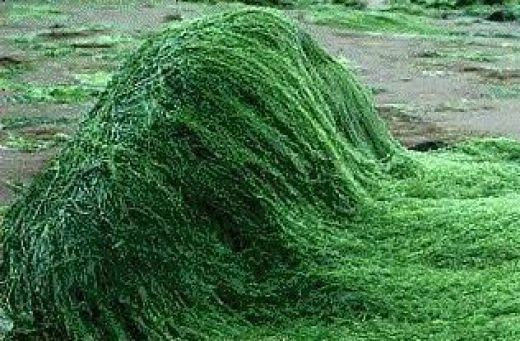 The Spirulina thrives in these ideal conditions, growing several times faster than in the wild. 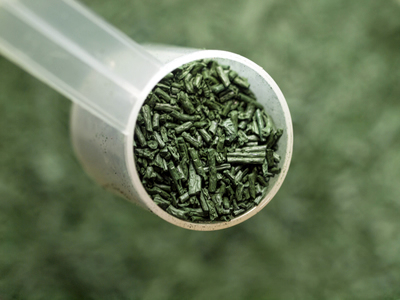 Cultured Spirulina grows so fast, it is harvested every 3 days. Harvesting is simpler than with other algae, because of Spirulina’s long, filament shape, which requires no centrifuge and is gentle on the cells. Right from harvest, it is sifted out on screens and given several freshwater washes, ensuring a clean product with a fresh, salt-free taste. Spirulina is Dried using the ultimate in drying technology, Ocean Chill Drying. It is a patented spray drying system in which deep, cold sea water is used to dehumidify and chill the air in the dryer. This allows for the elimination of oxygen, which protects carotenes, fatty acids, and enzyme concentrations. The Spirulina dries in about three seconds, and the recovered carbon dioxide is then recycled back to the ponds to nourish the growing Spirulina. Data from independent laboratories verify substantially higher levels of beta carotene than algae dried by any other method, including freeze-drying. IS SPIRULINA REALLY 100% SAFE? · The U.N. Industrial Development Organization (UNIDO) commissioned a five-year toxicology study on Spirulina and found it to be a safe, nontoxic food, and in a separate study “recommended it as a potential solution to the world food crisis and global protein shortage”. NASA has done extensive research into the use of algae as food for space travel, and chose Spirulina after beginning research with over 1,000 species of blue-green algae. Spirulina also has an ancient history as a food, being at the very beginning of the food chain. Huge flocks of the beautiful pink flamingos of Africa have eaten pounds of Spirulina every day for thousands of years. Many indigenous peoples have been using Spirulina for centuries, and today, it is being used by millions of people world wide -without any adverse effects. There are medically documented studies of people using only Spirulina with water & juice for long fasts – some up to and over a year! The fantastic results of these experiences – enhanced energy, mental clarity, better sleep and more along with impressive medical documentation, further prove that Spirulina is a safe and complete, life-enhancing Superfood. The safety of Spirulina is historical, not rhetorical. WHAT’ S THE BEST WAY TO GET STARTED WITH SPIRULINA? powder in a smoothie. The powder is more concentrated, so start light. Energy is continuously produced by the sun, but that energy is lost as foods move up the food chain. Food from plants at the lower levels of the food chain, such as Spirulina, contain the most food energy and nutrient value. They also use up the least of the planet’s resources in their growth and development. With each step up the food chain, energy and nutrient value are lost, and more of the Earth’s resources are used up. The resources we choose to consume will make all the difference in the re-balancing of our Earth’s delicate ecology. By focusing our energies on producing, eating, and sharing more Spirulina, we directly help to protect all life forms and more effectively conserve the Earth’s natural resources. ONE ACRE OF SPIRULINA WILL FIX NEARLY THREE TIMES AS MUCH CARBON AS THE AVERAGE ACRE OF FORESTLAND.